Sometimes simple is the best solution. It doesn’t get much simpler than the T/C Encore Pro Hunter platform; a single shot, single action, receiver which can be mated to any number of different rifle barrels in various calibers to produce anything from a modern muzzleloader to a close range brush gun in .500 Magnum. The version I spent a day with in Wyoming was chambered in .223 with a 26 inch fluted, stainless steel barrel. The rifle’s mission was simple: shoot as many prairie dogs as possible. Riding on top of this rifle was a Bushnell ELITE LONG RANGE HUNTER scope, the LRHS 3-12x 44mm. 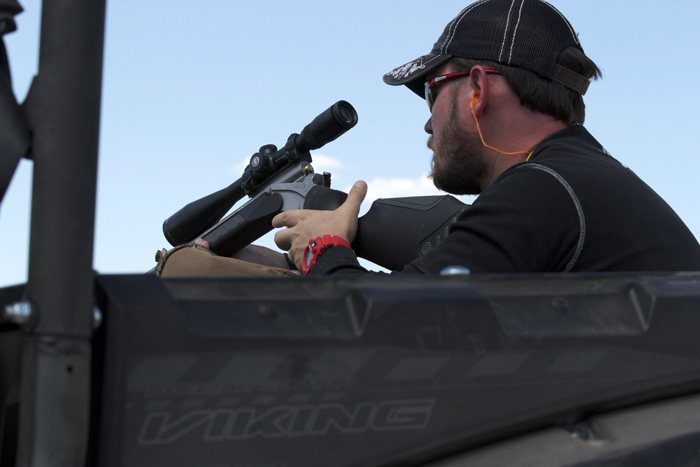 Again, I was very impressed by the quality and clarity of the Bushnell optics I used, I could easily hit prairie dogs at 200 yards with these scopes and could see them all the way out to 400 yards. 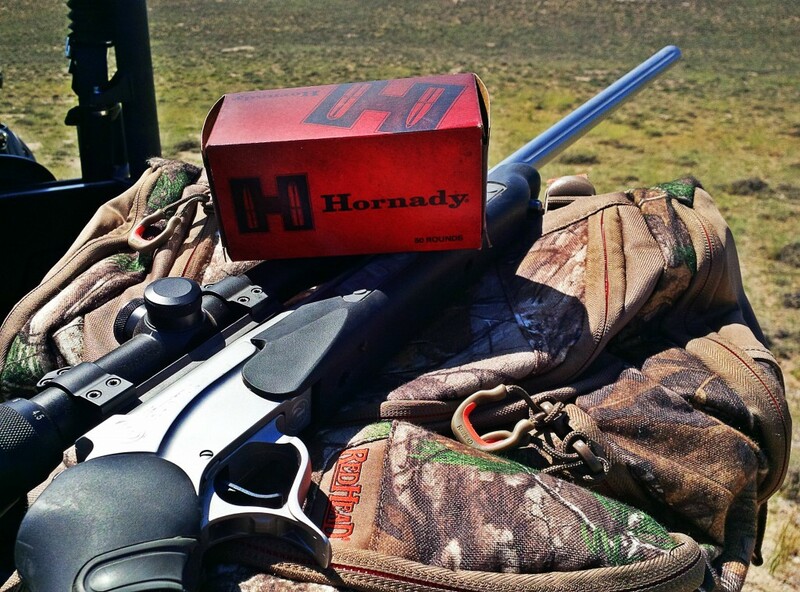 The T/C Encore Pro Hunter starts life as a stock and frame combination. It’s important for NFA purposes to only ever put rifle length barrels on the rifle stocks, and never to put a short, pistol length barrel on the rifle actions. As mentioned above, my sample was a rifle chambered in .223 Remington with a 26 inch barrel. Every Encore features an ambidextrous, single action mechanism; the hammer is rather clever in that it can pivoted either to the left or the right to make cocking the gun easier and to avoid striking any scopes that may be mounted on the gun. The action is released by pulling the lever that protrudes from and forms part of the trigger guard, which can be clearly seen in the below photo. Lacking a trigger pull gage, I wasn’t able to get an accurate assessment of the weight, however it was a very clean and relatively light trigger. I’d guess based on my Mark 1 Model 00 Index Lever Puller that it’s around 3 pounds. There are no ejectors on the gun, so each fired cartridge must be manually extracted by hand. Doing this while wearing gloves combined with the small diameter of a .223 cartridge was mildly annoying, and I found myself wishing for automatic ejectors when confronted by en masse charges of zombie prairie dogs. Actually shooting the T/C Encore is a blast. There is a certain zen quality about running a single shot rifle on distant targets, it forces you to take your time and take good shots. When running an AR15 on the plains rat hunt, I frequently found myself taking a “good enough” shot, knowing that I had 29 more shots to back it up if I wanted to purse the “accuracy by volume” approach. With the Encore Pro Hunter, every shot I attempted was the best shot I could take in that moment. Plus, because the gun was a .223 with a relatively long and heavy barrel and a large, comfortable cushioned stock, felt recoil was negligible. I could easily spot the fall of rounds through the scope; and when using the T/C Encore I was treated to frequent prairie dog explosions. Even when the rifle didn’t make contact, there is something satisfying about the manual process of reloading. It’s hard to describe, but cracking the action open, pulling out the spent casing, and inserting a new round had a primitive, retro feel to it. While I know it’s not the same as reloading a Trapdoor Springfield in the face of a charging Indian horde, the act of a manual reload on the Wyoming plains just felt right. I didn’t really want a T/C Encore before July 6th. Now, not only am I planning on ordering one, I understand why people buy them in such large numbers. Aside from the modular nature of the gun, which lets you play LEGO for grownups to your heart’s content, the T/C Encore just feels good to shoot. It’s everything I love in a rifle: lightweight, functional, accurate, and perfectly customizable to your mission. Would I recommend one for a tactical home defense gun? No, of course not. But a T/C Encore Pro Hunter rifle action can be successfully used for everything from a bone simple rimfire trainer all the way to a bear thumping .500 Magnum; a .223 varmint gun, or an Indiana woods deer-blaster. That’s pretty neat in my book, and now that I’ve finally spent some serious trigger time on one, I get what everyone else is saying. 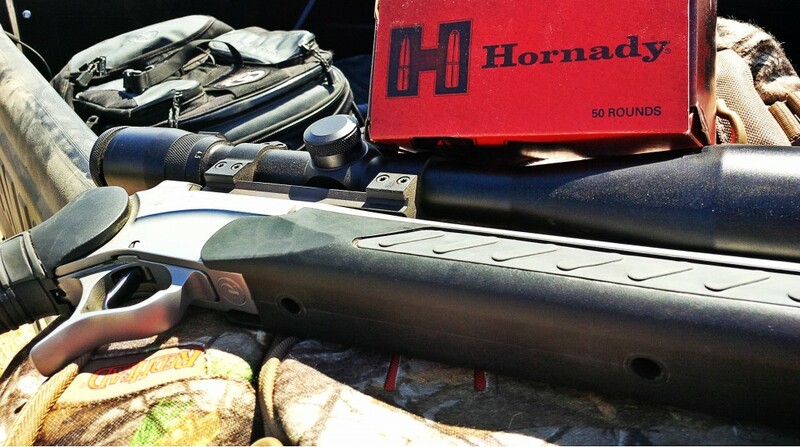 The T/C Encore Pro Hunter is a great platform, and in its varmint configuration was nearly perfect for eradicating prairie dogs. WARNING: If you are a gun nerd, do not buy an Encore (or a Contender) lest you find yourself rationalzing why you totally need that stainless ported 13″ barrel in 7mm TCU because, well, obviously. I have the .405 Winchester barrel in case a lion gets out of the zoo. I kind of want the .45/70 barrel in case of the same thing.